Your programming guide to Warriors Day on NBA TV. Don't look now, but the 2018-19 NBA season is right around the corner. In just a few weeks, the Warriors will convene for Media Day on September 24th, which will signal the unofficial start of Golden State's title defense. Following Media Day, the team will proceed through Training Camp and a slate of five preseason games before raising another Championship banner to the rafters of Oracle Arena when the Warriors host the Oklahoma City Thunder on Opening Night on October 16th. It will be here before we know it, but until things really start ramping up, NBA TV has got you covered. Tomorrow (Tuesday, August 28th) will be Warriors Day on NBA TV, throughout which the channel will replay numerous memorable games from Golden State lore, dating back more than 40 years. Some of the games will still be fresh in your memory; for others, Tuesday might offer you the first chance to rewatch the game in multiple decades. Regardless, it's sure to be a fun time had by all of Dub Nation. Warriors Day will commence with one of the most critical Game 7's in franchise history. The 1975 Warriors took Game 1 of the Western Conference Finals at home, but suffered a brutal last minute defeat in Game 2, lost in Game 3 and trailed by 17 points at the end of the first quarter of Game 4 before storming back to tie the series. They lost Game 5 at home, but returned the favor to the Bulls in Game 6, setting up a winner-take-all scenario for the right to advance to the NBA Finals. After trailing by double digits for the majority of the contest, Golden State outscored Chicago 24-14 in the fourth and final quarter to win 83-79. Rick Barry sank six of his final eight shot attempts, and finished with a team-high 22 points. Riding the high of their series victory over the Bulls, the Warriors carried their momentum into the NBA Finals, where they'd play the role of the underdog yet again, this time against a Washington Bullets team full of All-Stars. That didn't stop them from winning the first NBA title in the Golden State era, however. Not by a long shot. The Warriors earned three and one-point victories in the first two games of the series, before taking a commanding 3-0 series lead with a 109-101 win in Game 3. In Game 4, Golden State clawed their way back from another early double-digit deficit, and secured a series sweep on a Butch Beard free throw in the final minute to claim the league title. Before Klay Thompson scored 37 points in a quarter, there was Sleepy Floyd's 34 points in 11 minutes. But whereas Thompson's record-breaking performance came in a regular season game, Floyd did it with his team on the brink of elimination. After losing the first three games of the 1987 Western Conference Semifinals to the vaunted Lakers, Floyd put the team on his back and registered an NBA playoff record 29 points in the fourth quarter and 39 points in the second half to help Golden State stave off elimination. He finished with a career-high 51 points in the victory. After beating the second-seeded Spurs in four games in the first round, the Warriors advanced to the 1991 Western Conference Semifinals, pitting two legendary NBA teams against one another. It was Run TMC versus the Showtime Lakers, and after Chris Mullin missed Game 1 with a knee injury, he returned with a vengeance in Game 2. He scored 16 points in the first half, but caught fire in the second to lead Golden State back from a nine-point halftime deficit. In the third quarter, he shot a perfect 6-for-6 from the field for 17 points (sound like anyone?) and would finish with a team-high 41 points on 21 shot attempts. The Warriors trailed by four points with 30 seconds left, but staged a shocking comeback to take a 125-124 lead with 3.1 seconds left, which would prove to be the final score in the contest. It was the Warriors' first playoff win at the Great Western Forum in 22 years. After winning 16 of their final 21 games to clinch a playoff spot on the final day of the regular season, the We Believe Warriors entered their first round series with the top-seeded Mavericks full of confidence. Golden State had performed well against Dallas during the regular season, and that success carried over to their postseason series, at the end of which the Dubs became the first eight-seed in NBA history to defeat a one-seed in a seven-game series. After stealing Game 1 on the road and blowing the Mavericks out at home in Game 3 to take a 2-1 series lead, the Warriors surged ahead in the fourth quarter to put Dallas on the brink of elimination. The Mavericks seemed to have no answer for Warriors' point guard Baron Davis, who scored a game-high 33 points on 12-of-17 shooting from the field, including a halftime buzzer-beater from midcourt that launched the deafening Oracle Arena crowd into a frenzy. In Steve Kerr's first season at the helm, the Warriors won their first NBA Championship in four decades and their first of three titles in the last four years. 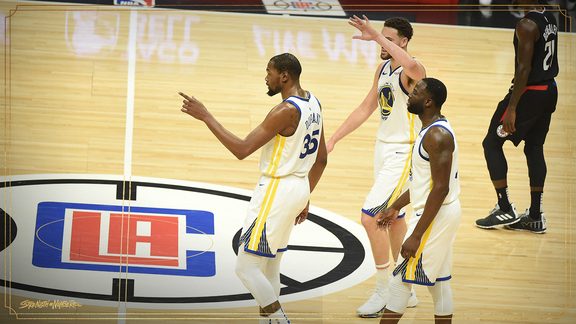 After falling behind two games to one in the series, Kerr moved Andre Iguodala into the starting lineup, and Golden State bounced back with consecutive victories in Games 4 and 5, leaving them one victory away from attaining the league's ultimate prize. On the road in Game 6, league MVP Stephen Curry and eventual Finals MVP Iguodala scored 25 points apiece, while Draymond Green recorded a triple-double to win the 2015 NBA Championship. Only one regular season game will be featured on Warriors Day, and what it lacks for in quantity, it makes up for in quality. On February 28, 2016 in Oklahoma City, Stephen Curry put the exclamation point on a legendary shooting performance with one of the shocking finishes you'll ever see. With the game tied at 118-118 with just over six seconds left in overtime, Andre Iguodala rebounded a Thunder miss and found Curry, who took three dribbles before pulling up from 32-feet and...BANG! BANG! Curry's shot splashed through the net to give him 46 points and an NBA single-game record-tying 12th three-pointer. That trey would prove to be the decisive points in the victory, which not only improved Golden State's record to an astounding 53-5, but also made them the first team since the 1987-88 Lakers to clinch a playoff berth before March. The similarities were uncanny. At nearly the exact same time in the game from nearly the exact same spot on the floor that he converted a three-point dagger to give the Dubs a commanding 3-0 series lead in the 2017 NBA Finals, Kevin Durant gave the Warriors, Cavaliers and anyone else watching a serious case of déjà vu when he poured in the final three of his playoff career-high 43 points with 49.8 seconds left in Game 3 of the 2018 NBA Finals. When the game came to a close, Golden State found themselves one victory away from winning the Championship for the second consecutive season. Unlike 2017, however, the Dubs completed the series sweep with a Game 4 victory, making them the ninth team in NBA history to sweep the Finals.